This morning I took one of those quizzes that come up on Facebook. You know the ones, things to tell you if you have an above average memory, or what your underlying personality type is. 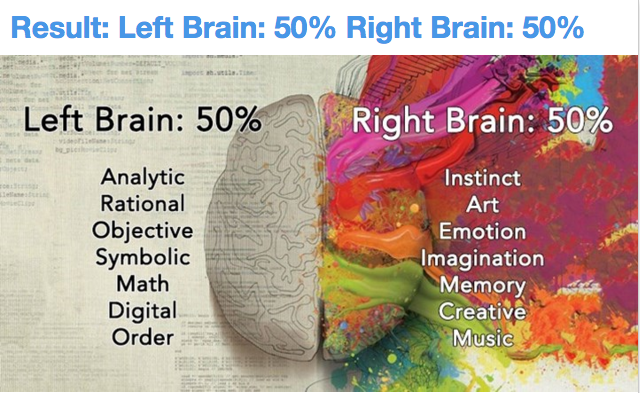 This one was right brain vs left brain, so being of artistic mind, I was naturally intrigued (see quiz here). I expected to be all about the right brain. I am a little chaotic and twirly, and most of my interests center around reading... writing... designing... music... and an unhealthy attachment to my dog. I do not like math. I do not like hard questions about life and the affairs of men. When playing strategy board games, my strategy is usually to make big, bold moves and have fun while losing everything. But I am also compulsively early, like to keep my workspace semi-neat-ish, follow recipes (sort of), and dislike math problems involving shapes. All of this to say, that my brain is divided 50/50. Though if you ask me, at this present moment, its divided 20/80, the 80 being the percentage that still needs to be soaked in coffee for an hour before I become a tolerable human.